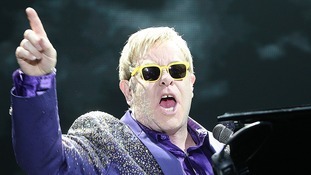 It's been announced that Elton John and his band are to play Kingsholm Stadium in Gloucester next year as part of their European tour. The concert on Sunday 7 June will be the rock star's first ever performance in Gloucester. It will feature classics from his five-decade-long career. I am very much looking forward to playing my first show in Gloucester. My drummer, Nigel Olsson, and guitarist, Davey Johnstone, have been with me since 1970 and 1972 respectively and we all have such fond memories of our early shows in the area. The fans there have always shown a great love for my music and my band and I can't wait to bring our show to Kingsholm Stadium. I promise it will be worth the wait and am sure we will all have a fantastic time. Gloucester Rugby's Chief Executive says the club couldn't be more excited about the gig. We have held some successful concerts at the stadium in the past but this really enhances our reputation as a venue for top quality acts and will be part of an exciting year for the club, culminating with hosting four fixtures as part of Rugby World Cup 2015 later in the year. Tickets go on sale on Friday 28 November at 9am.